Something most critics (yours truly included) have to embrace is the fact that not all bands break fresh ground, and they don’t have to. If a band does something that has been done before, but does it well, they should be lauded for that. Silvertide is a band that deserves recognition. They play an exciting brand of retro rock and roll that gets hands clapping and girls dancing. 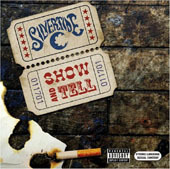 Silvertide’s Show And Tell is a record full of powerful riffs lifting songs about girls and good times. Lead singer Walt Lafty’s voice sounds quite like the Black Crows’ Chris Robinson, something that should help the band gain more exposure. Lafty does well channeling his emotions through his vocals, and is helped along the way with solid riffage from the dual guitars. Throughout the album the guitars are allowed to given to range and flow as the low end is kept tight and right. The bass helps drive the songs forward as the drums keep a solid, lively beat. The most shocking thing about Show And Tell is that it comes from a bunch of Philadelphia guys rather than some good ole’ boys. There is a down home good feeling that hits right at the outset with “Ain’t Coming Home” (the band’s first single) that stays throughout the album. It lends a sense of optimism to songs about missing and/or breaking up with a girlfriend (“California Rain” and “Heartstrong”), the inevitability of change (“Nothing Stays”) and even war (“Foxhole Jesus Christ”). In an age where punk rages against the government on mainstream radio, materialistic hip hop is everywhere and emo whines and cries about high school girlfriends, Silvertide’s straightforward brand of good-time rock is refreshing and a must listen.